1. Boil some thin noodles/ spaghetti in salted water with a tablespoon of oil (about 2 cups boiled noodles). When done, strain it, wash it & keep it aside. 2. 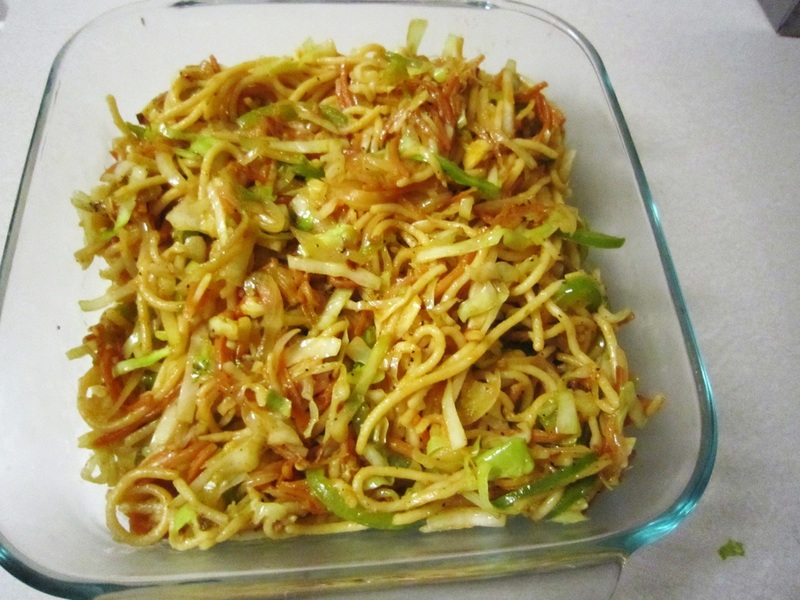 Cut thinly or shred some vegetables like 2 carrots, 1 green/red peppers or capsicum, 1 big onion, & 1/4th medium cabbage. 3. Stir fry: Take some oil (2Tbs) in a big shallow non-stick pan or karahi. When hot, add onions, carrots & capsicum. Stir for few min. on medium-high heat. When slightly soft, add shredded cabbage. Stir for 2 min till tender. Add the boiled noodles. Mix well. Add 1-2 Tbs soya sauce, sprinkle 1.5 Tbs vinegar, some ketchup, red crushed pepper or red hot sauce, black pepper, salt. If you have sweet & sour sauce either ready-made or home-made or from Chinese food restaurant, such as Panda Express...you can add that for special Chinese flavor. Mix everything well & its ready to eat. 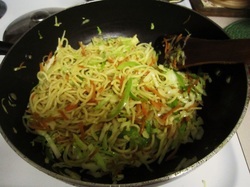 Why not make chowmein at home instead of eating at Panda Express...sometimes home-made chowmein is tastier & healthier..less oil, more veggies! !